Project TRUE is a research internship program for high school students in the New York City area. The students choose between two fields of study, invertebrates or birds, to focus on during the ten-week internship. 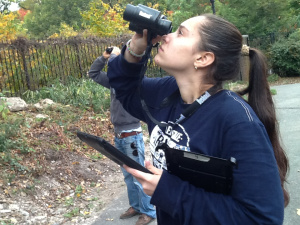 A Project TRUE teen searches for birds in Prospect Park. Photo by Sabryna John-Charles. The first cohort of teens participated in the project from October 2013 to mid-January 2014. A blog was created as part of the civic engagement aspect of Project TRUE. The teen interns generated the content for the blog and decided what should be posted. Jason Aloisio, Fordham University PhD Candidate and City Zoos Urban Ecologist, and Debbie Dieneman, Coordinator of Volunteers a Prospect Park Zoo, facilitate the internship activities and manage the Project TRUE blog. To spread word about the work that the teens in Project TRUE are doing, the blog is featured on the WCS Project TRUE website page, found here, and is used in school presentations that each of the interns give at the end of the semester. Posted in Fordham University & Wildlife Conservation Society, Partnerships.